Legal thrillers are not usually a genre that I would read. However, when I was presented with the opportunity to read this book as part of a blog tour, I jumped at the chance due to the unusual premise of the book. This wasn’t about the lawyer trying to prove the innocence of their client, but trying to prove whether their client had a fair trial that resulted in the death penalty being given. This is something that I am really not overly familiar with and when you read it, this could come across as dry. This isn’t the case and the book was a very interesting read. The attorney on this case, Janet is an easy character to empathise with. These are clearly cases that are some of the more difficult to fight, yet you get the feeling that she enjoys her work. This latest case proves to be a bit of a puzzle and as you learn the facts surrounding the case with Janet, you can’t help but see the possible flaws in her client’s trial. Janet came across as combination of Alicia Florrick from The Good Wife and Miss Marple, with her knowledge of the law and her interest in uncovering the truth. As for Andy, I found myself sympathetic towards him. Deep down I knew that he shared some of the guilt but I couldn’t help but feel that he was made a sacrificial lamb in order to save his brothers skin. He just didn’t seem to come across as the type of person who would be the mastermind of the crimes that he was found guilty of. When the truth about Andy does come out, you begin to see that there are flaws in the system and that there are lawyers and law firms who use these type of cases as a cottage industry. The only saving grace is the fact that there is an extensive and long appeals process to try to right these wrongs. Even when the truth does come out, Andy still had a role to play in the crimes but this is not to the same extent that he had been convicted of. As this is told through Janets eyes, you don’t get much of an insight into very many of the other characters. The only other character who you spent some time with was Andy’s half-sister, Carla. She only really comes into the book about half way but her role has a massive impact on the case. In a way her history is as tragic as Andy and in some ways even more so. She was the only other character who I had grown attached to and watching her story arc develop was at times sad to read. The ending wasn’t what I was expecting and in a way suits the book very well. As I closed it, I found myself hoping that we will get more books with this character as I can see this being a really interesting series. It is clear that Robertson knows her stuff with regards to the legal system. She has injected the human side into this story really well and you can’t help but see how this system is both a blessing and curse. If you like books where you are deconstructing the “facts” to get to the root of the truth, this is right up your street. 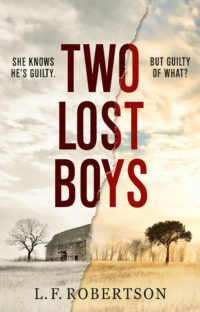 I found Two Lost Boys a really refreshing read and will be looking out for more by this new author.